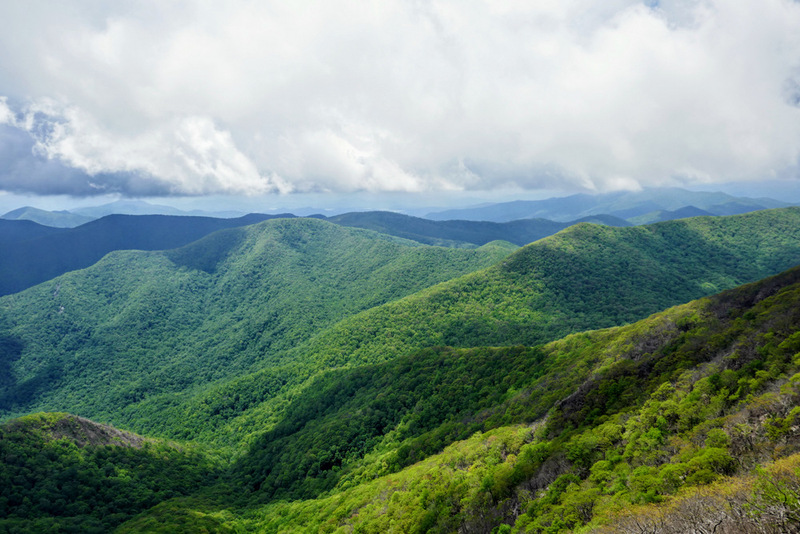 Standing Indian Mountain, nicknamed the “Grandstand of the Nantahalas,” is the highest peak in the Nantahala Mountains of North Carolina and Georgia. 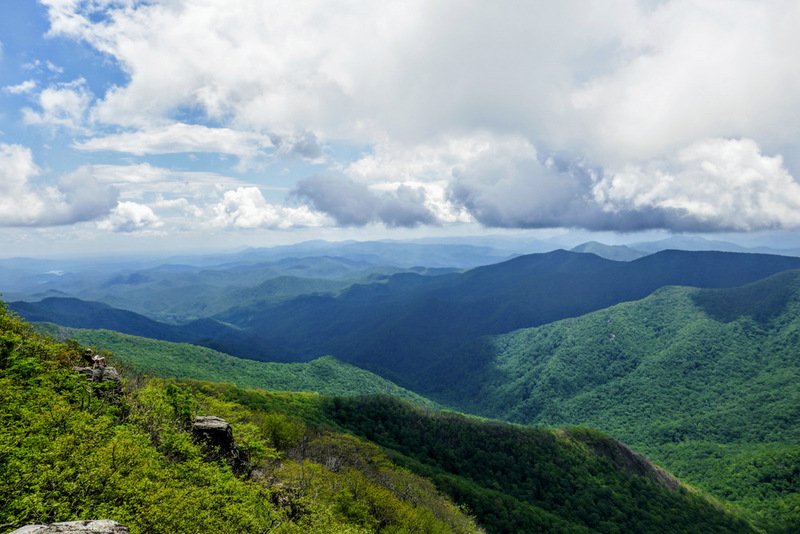 This landmark is well-known to Appalachian Trail thru hikers since it is the highest elevation along the trail south of the Great Smoky Mountains. 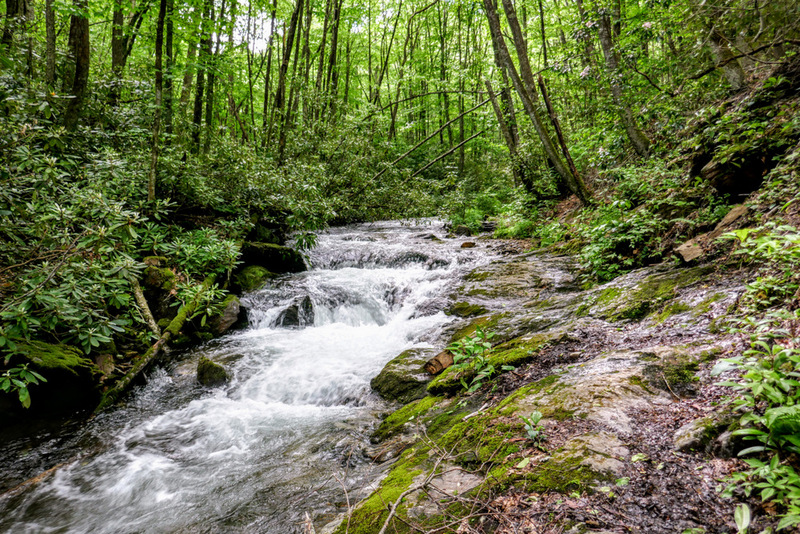 Nestled deep within the Southern Nantahala Wilderness, Standing Indian cannot be reached without putting some miles on your feet. The shortest access is via Deep Gap on FR 71, which is 2.5 miles from the summit. 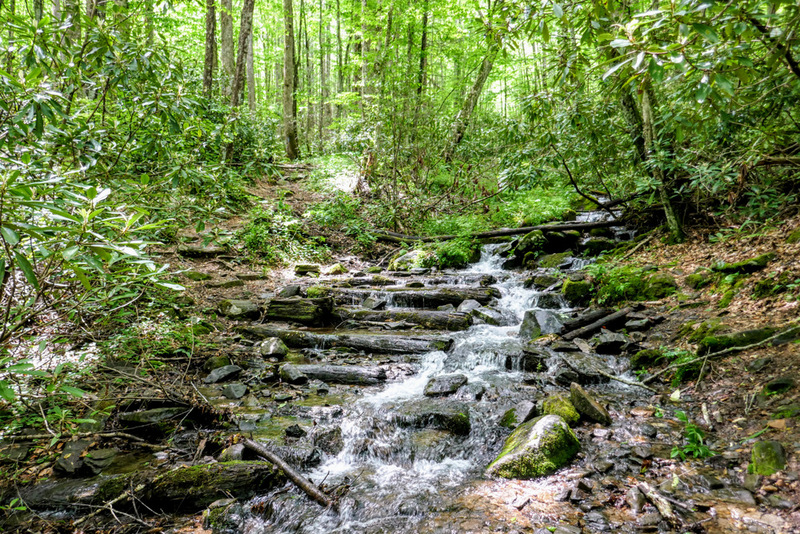 However, the Lower Trail Ridge and Kimsey Creek trail loop affords a longer hike that is easily accessible from U.S. 64. 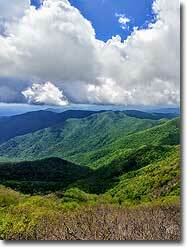 From the Standing Indian Campground follow the Lower Trail Ridge Trail into the Southern Nantahala Wilderness. 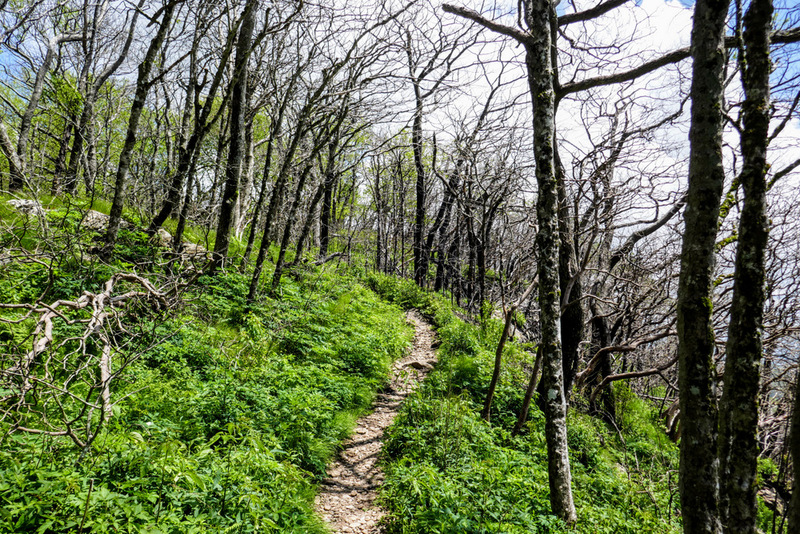 Although the elevation change is approximately 2,000 feet over 4.3 miles, the trail is never steep. Despite the low foot traffic and official wilderness designation, the trail is in surprisingly good shape and is currently blazed. 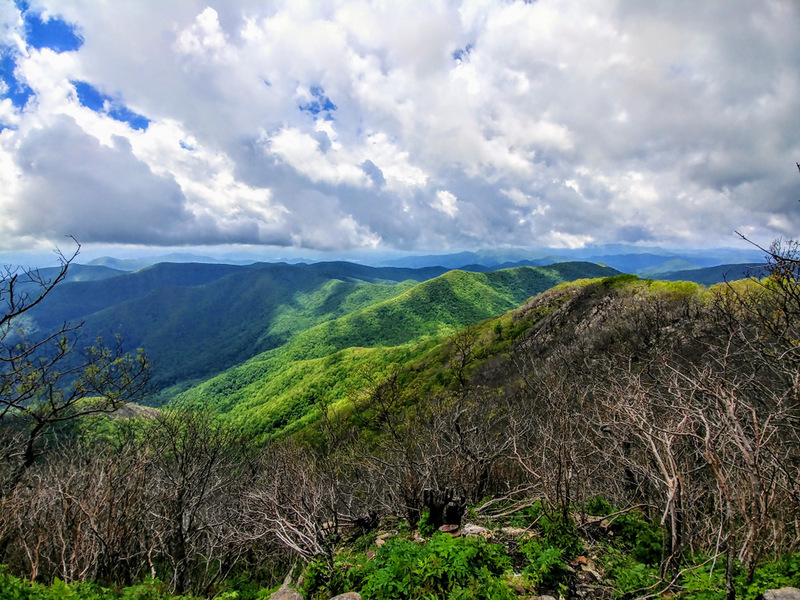 The summit is just above the Appalachian Trail intersection and provides wonderful views south and west of the Tallulah River headwaters, Rabun Bald, and the Fires Creek Rim. Below the summit the Appalachian Trail travels west towards Deep Gap, passing by the Standing Indian Shelter which is your best area for an overnight campsite. 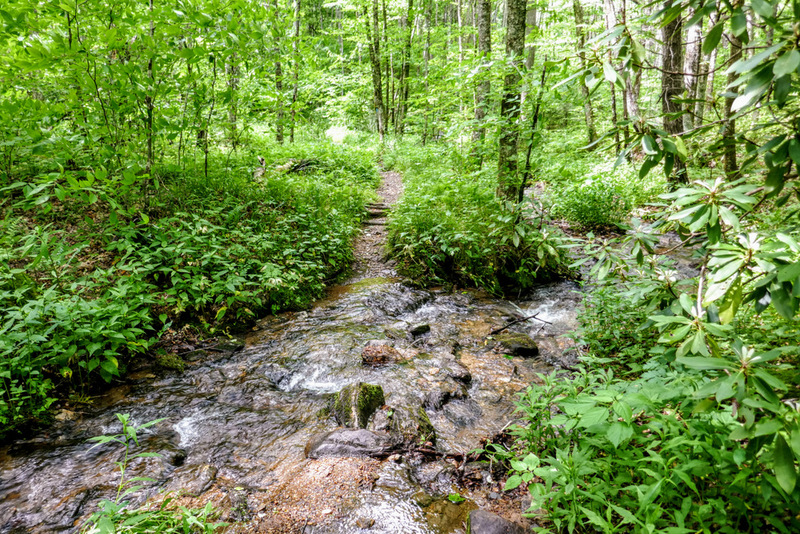 From Deep Gap pick up the Kimsey Creek Trail, which parallels the creek for 2+ miles before ending at the Standing Indian Campground. 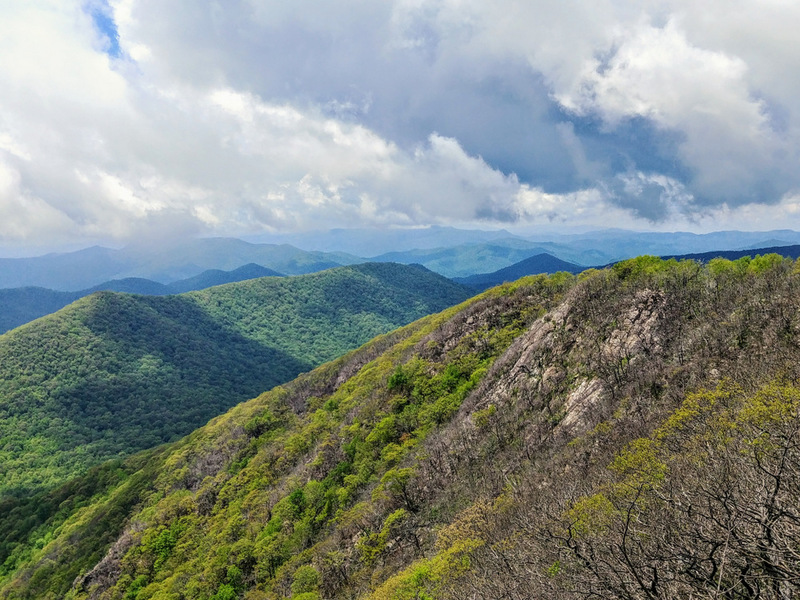 This is a great introduction to the Southern Nantahala Wilderness and easier than the mileage and elevation gain suggest. 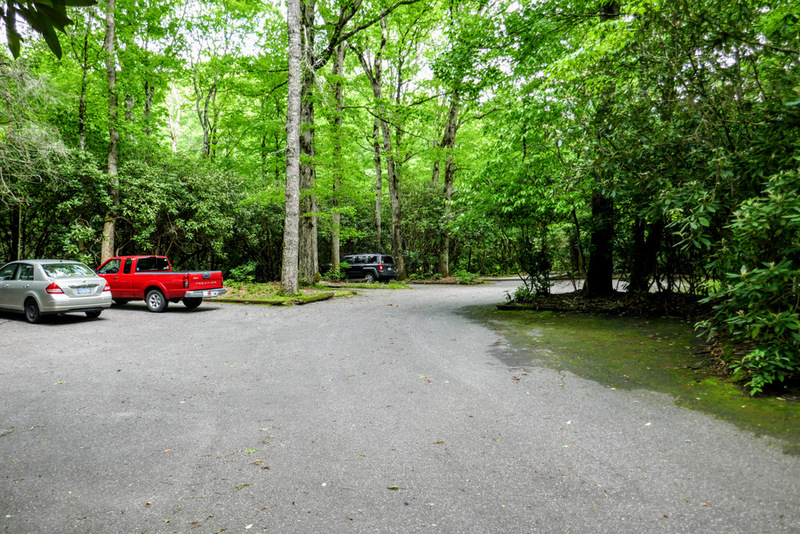 Alternate Parking – You can also park at the Standing Indian Campground day-use parking and picnic area. 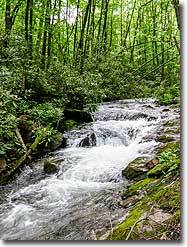 This is located a few hundred feet north of the bridge over the Nantahala River. Parking here requires a $2 day-use fee. 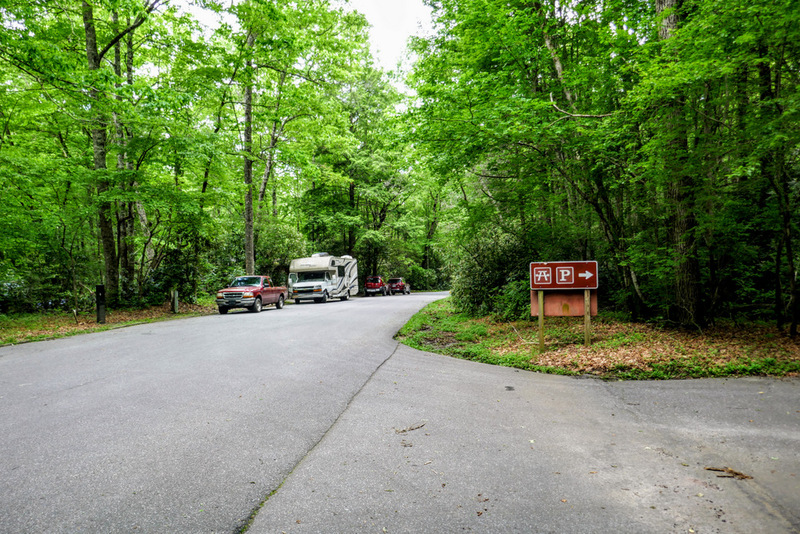 Additionally, the campground entrance is closed from Dec 1 – Mar 31. Mile 0.0 – Parking is available on FR 67 on either side of Long Branch. The Backcountry Information Center is located before crossing Long Branch at the intersection of FR 67 and FR 67B. 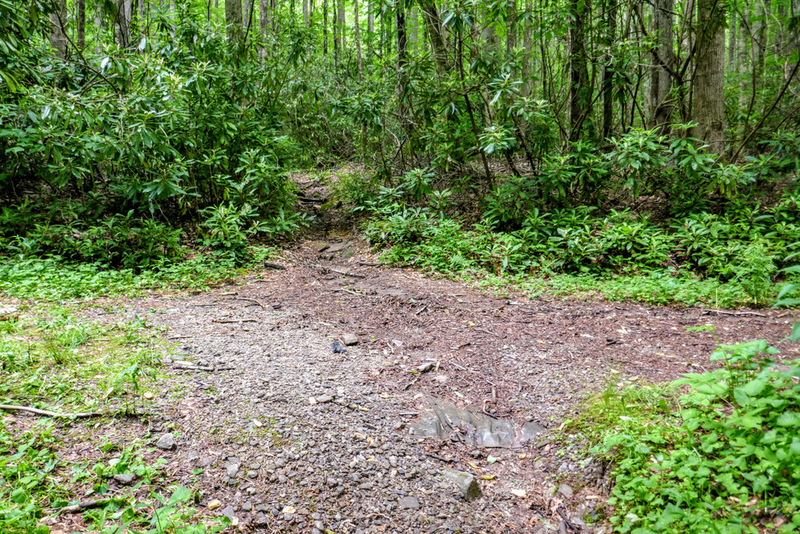 This is the trailhead for the Blackwell Gap Loop Trail  which initially follows FR 67B. Immediately after crossing Long Branch is additional parking for the Lower Trail Ridge Trail  (blue blaze) and the Long Branch Trail . The Long Branch Trail heads east. 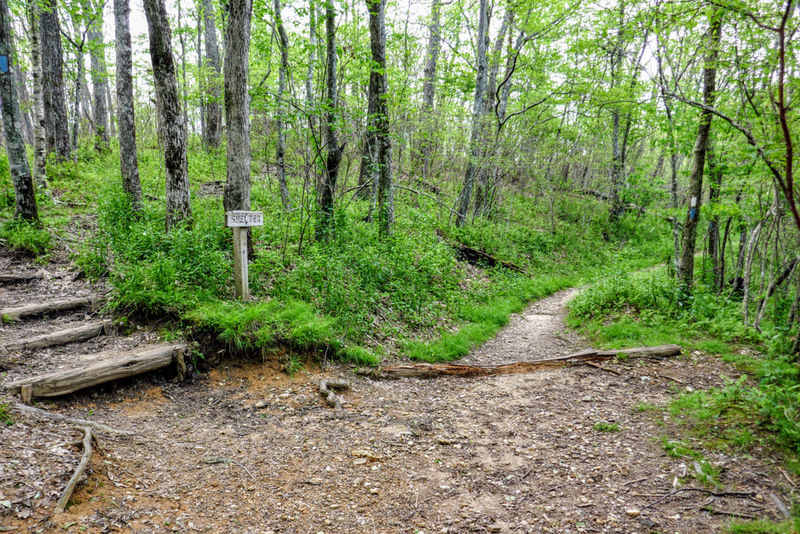 To begin the hike, follow the Lower Trail Ridge Trail west towards the Standing Indian Campground. 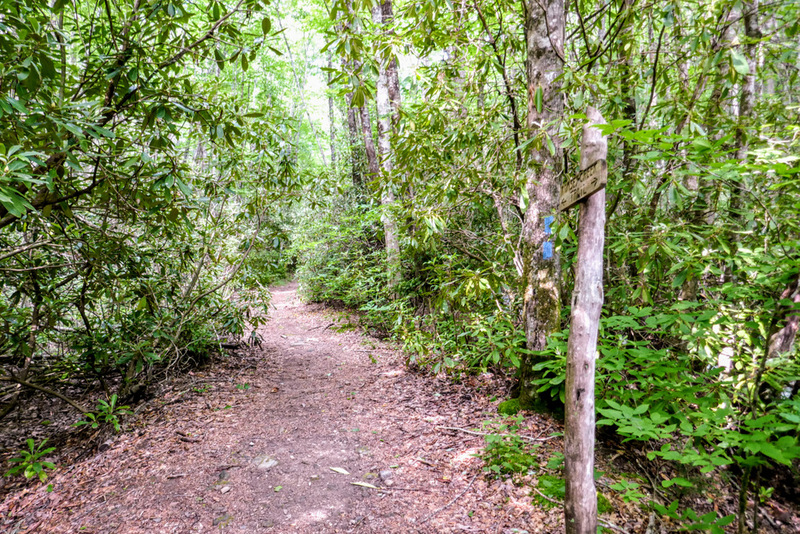 On many maps you will see the name shortened to the Lower Ridge Trail. 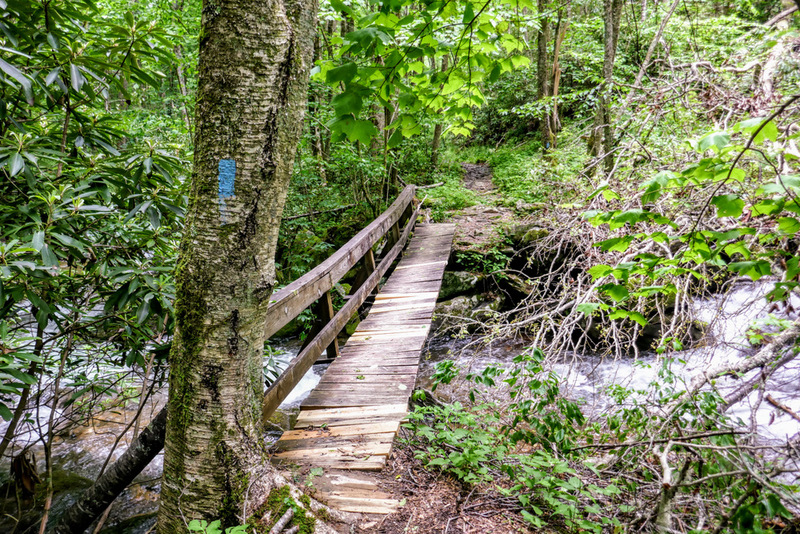 Mile 0.1 – Lower Trail Ridge Trail crosses Long Branch on a wooden bridge and meets Standing Indian Campground Rd. 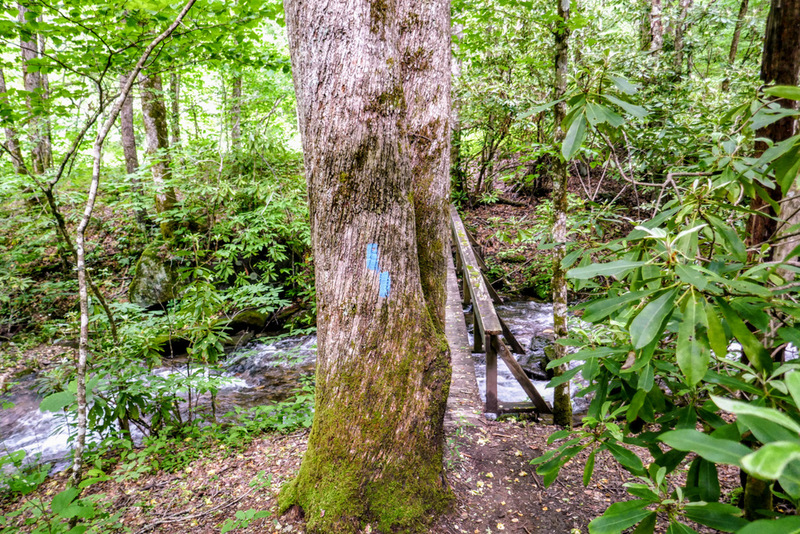 Turn left to cross the Nantahala River. The day-use parking lot for the Standing Indian Campground is located a few hundred feet on the right. 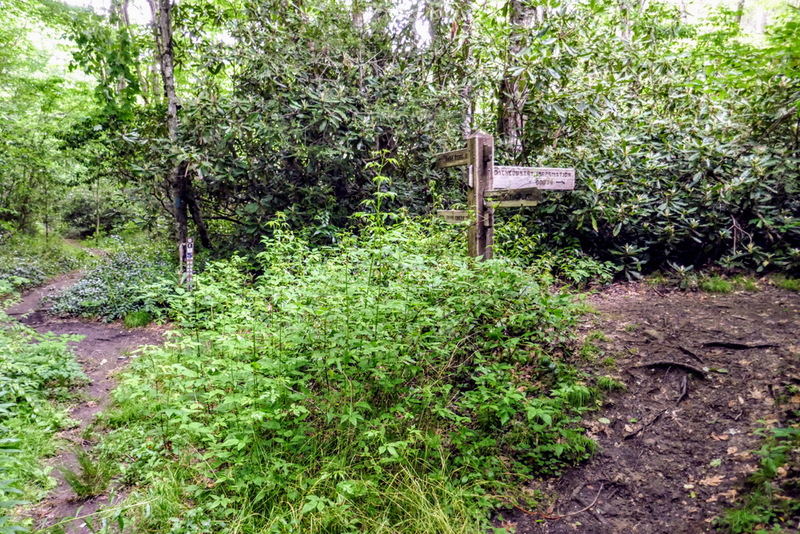 Mile 0.2 – On the other side of the river is a four-way junction for the Lower Trail Ridge Trail and Kimsey Creek Trail . Turn left onto the Lower Trail Ridge Trail. 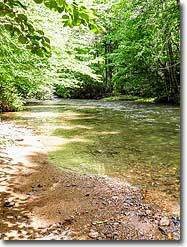 The trail follows a narrow strip of land between the Nantahala River and group campsites. Mile 0.45 – Follow the FR 424E bridge over Kimsey Creek then leave the road turning right. Mile 0.5 – Cross FR 424E a second time. Mile 0.75 – Rock hop a small unnamed tributary, then cross FR 424D1. After crossing FR 424D1 you will leave the Standing Indian Campground roads. 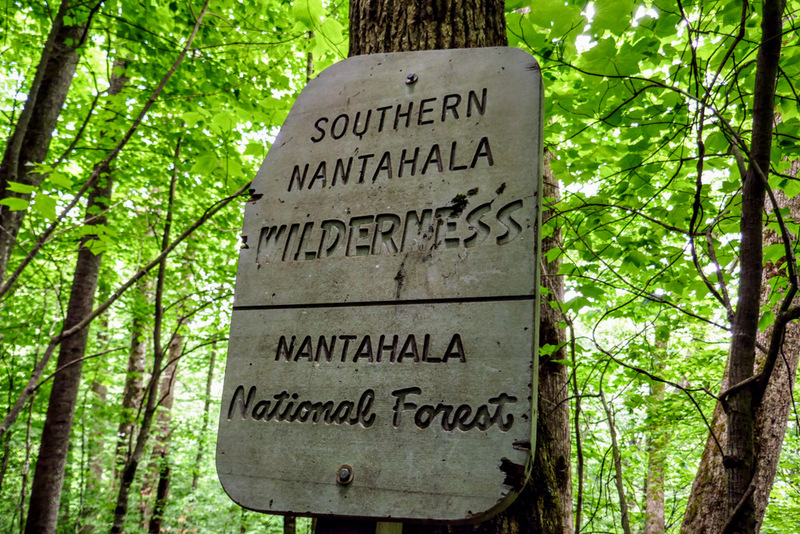 Mile 1.7 – Enter the Southern Nantahala Wilderness. 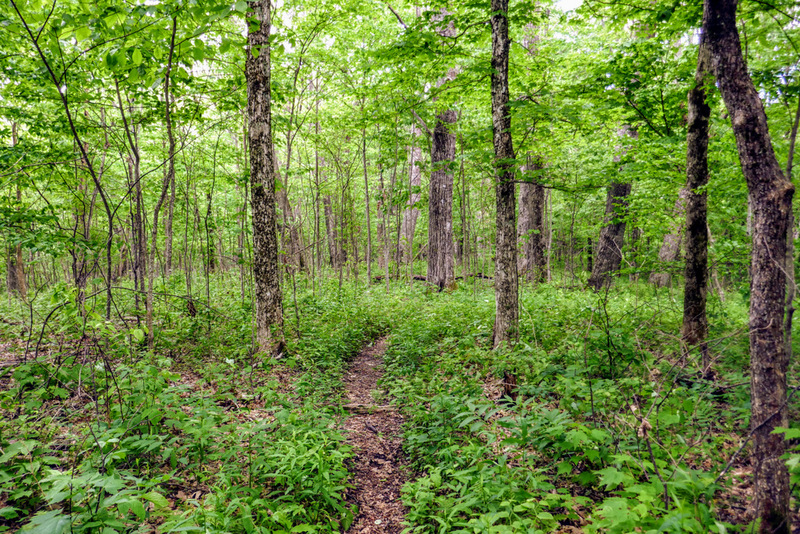 You’ll climb through sparse hardwood forests with a pleasant understory of grasses and ferns. 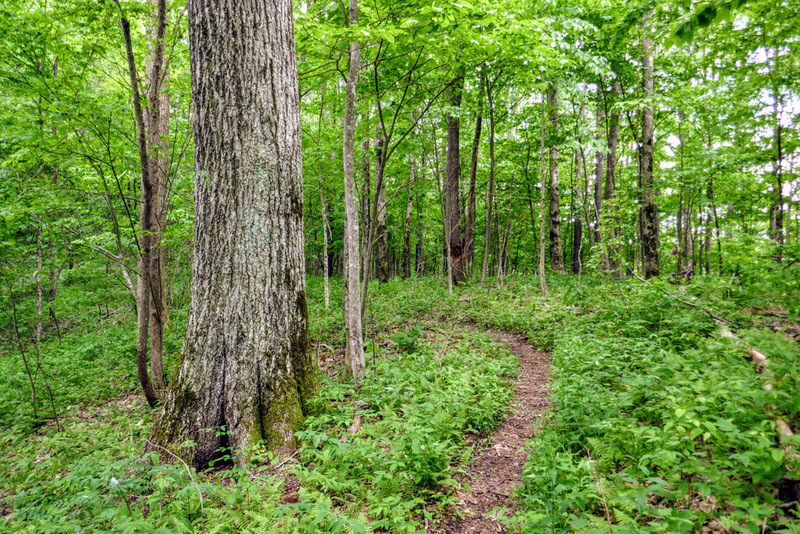 Occasionally you’ll spot large second-growth hardwoods. 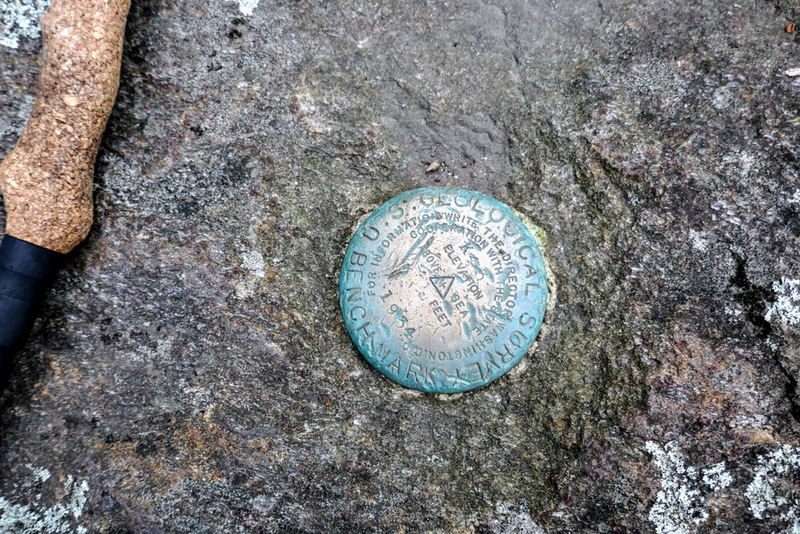 Mile 2.3 – Pass through John Gap. Although there are no established primitive campsites, this gap is very wide and flat and could easily accommodate tents. 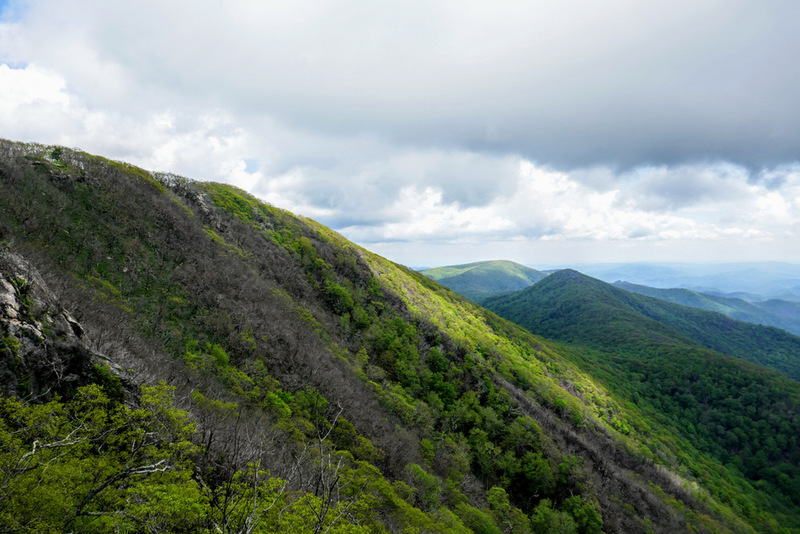 Mile 3.5 – Pass through Frank Gap between Frog Mountain and Standing Indian Mountain. 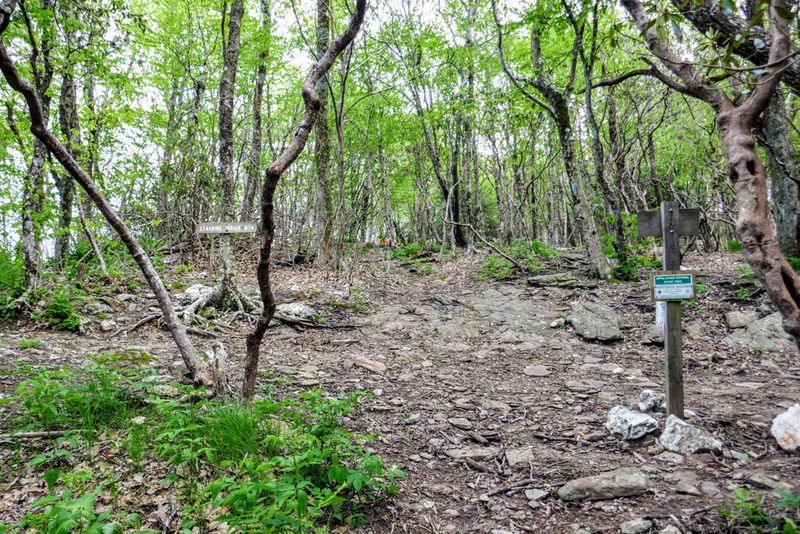 Mile 4.3 – The Lower Trail Ridge Trail ends at a T-junction with the Appalachian Trail. 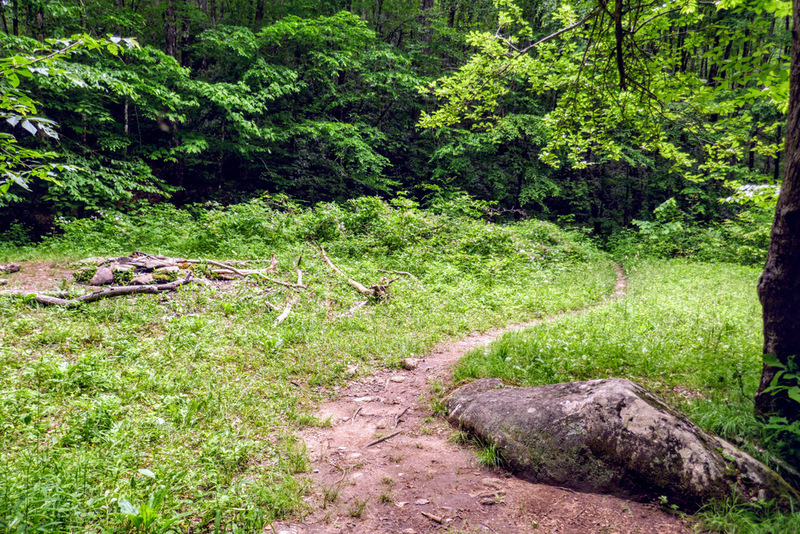 A heavily used side trail continues straight towards the summit. 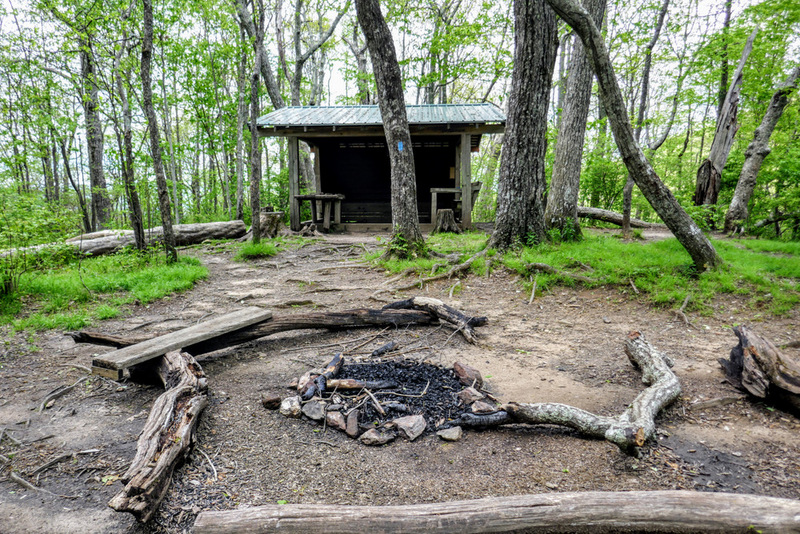 There are good campsites on both sides of the trail. 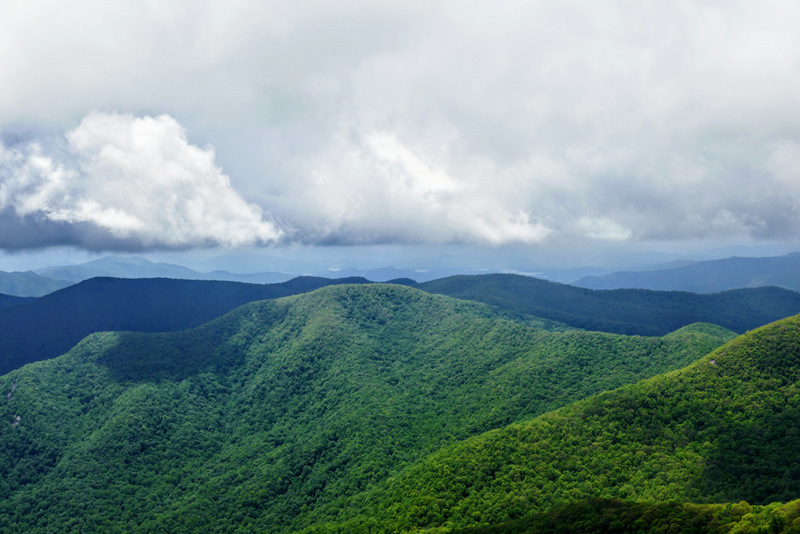 Mile 4.4 – Reach the summit of Standing Indian Mountain (5,499 feet). 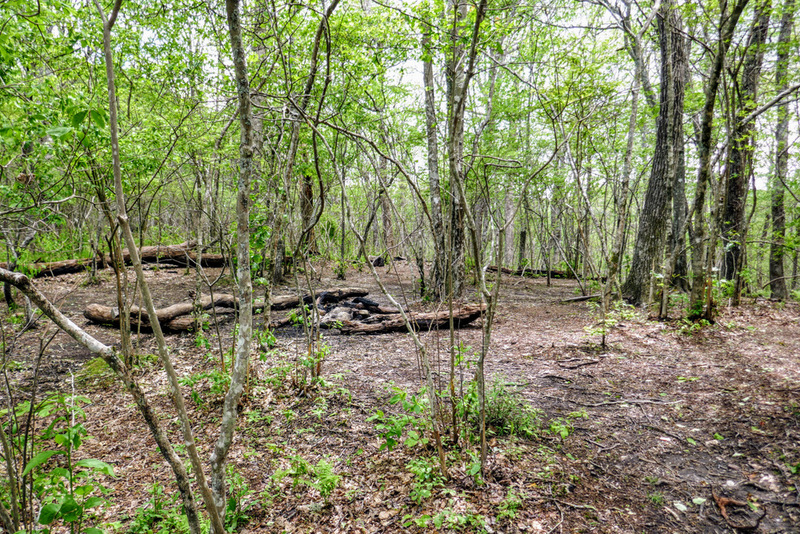 The small clearing was the site of a former lookout tower until it was abandoned in 1951 and removed in the mid-1960s. The lookout tower on nearby Albert Mountain served as a replacement. There is a good view from the clearing on the summit, but you should continue on the trail southeast to a better overlook. 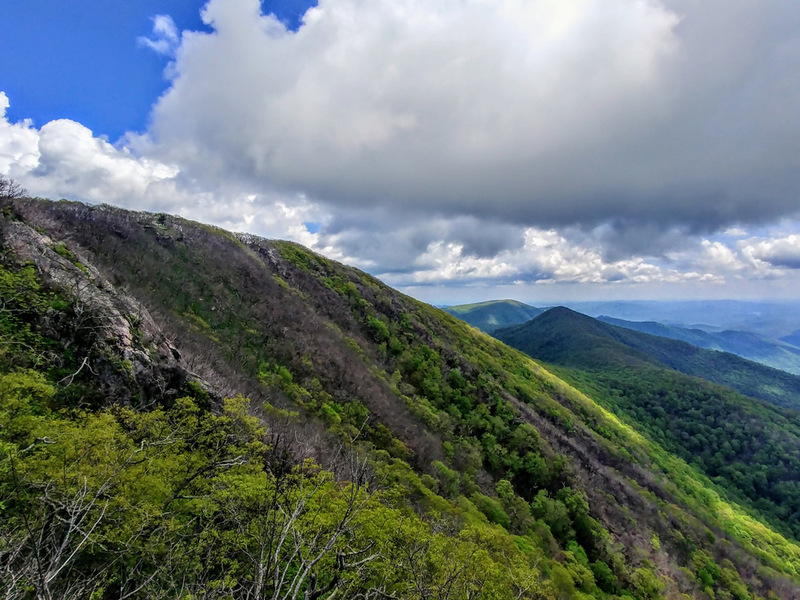 Mile 4.5 – The side trail leads to rock outcrops with panoramic views south to west. 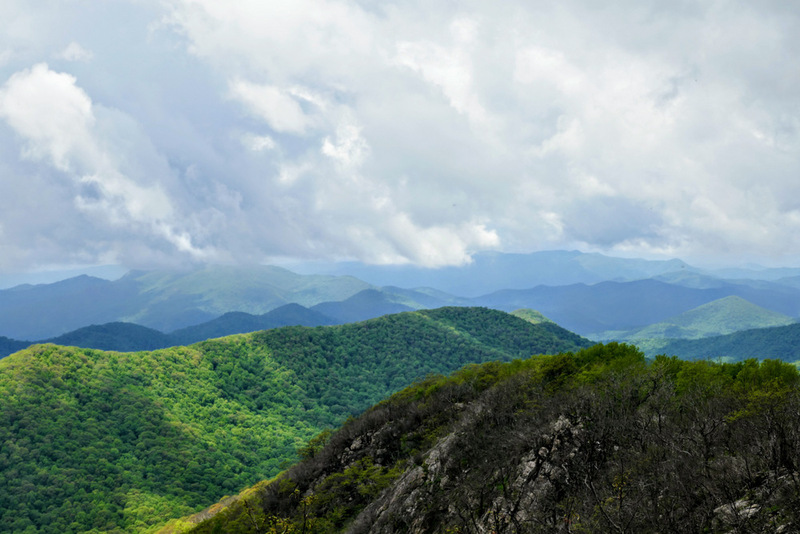 The Appalachian Trail follows the crest of the Nantahala Mountains southwest, forming a horseshoe around the headwaters of the Tallulah River in Georgia. 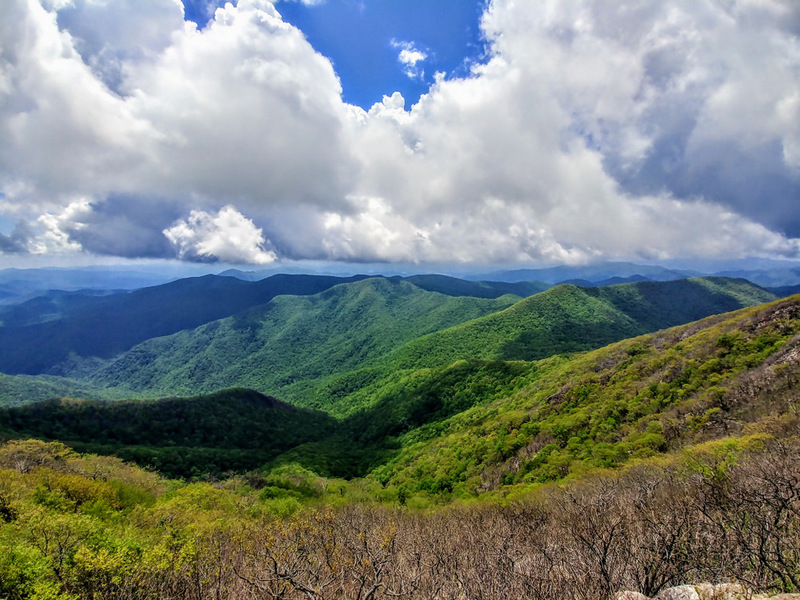 Although not viewable from the summit, the eastern rim of the Nantahalas form a similar horseshoe around the headwaters of the Nantahala River. Immediately below the summit towards the west, Deep Gap sits between Big Laurel and Yellow Mountain and the ridge leading to Standing Indian. In the distant west are the shimmering waters of Lake Chatuge. Slightly north of west is Boteler Peak, the high point of the Chunky Gal Mountain massif. 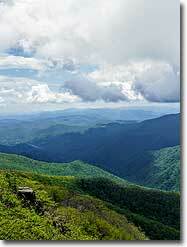 The dominant Tusquitee and Valley River mountain ranges comprise the Fires Creek Rim in the distant northwest. 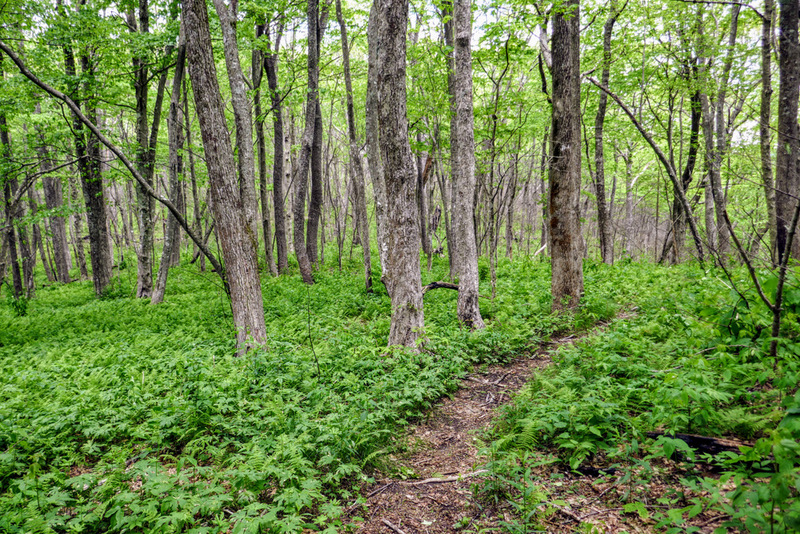 Mile 4.7 – Turn left onto the Appalachian Trail  (white blaze) heading west (directionally south). 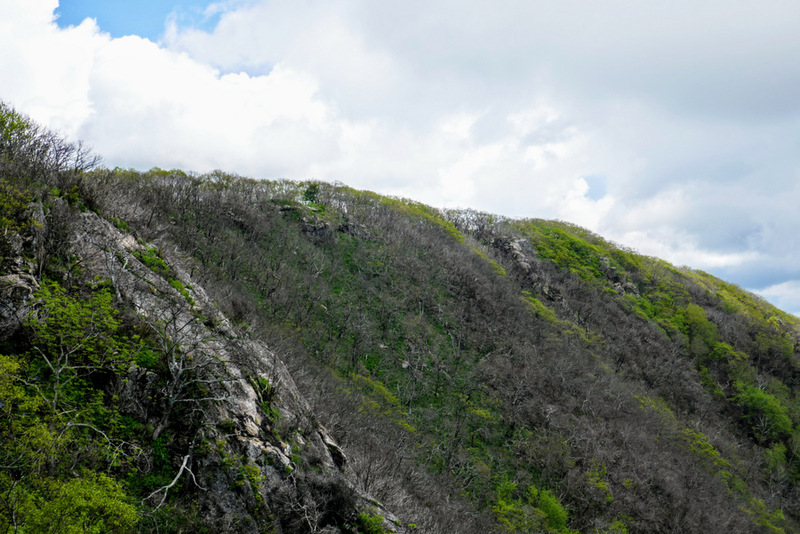 The AT follows the ridgeline through fire-scarred trees from recent forest fires (November 2016). 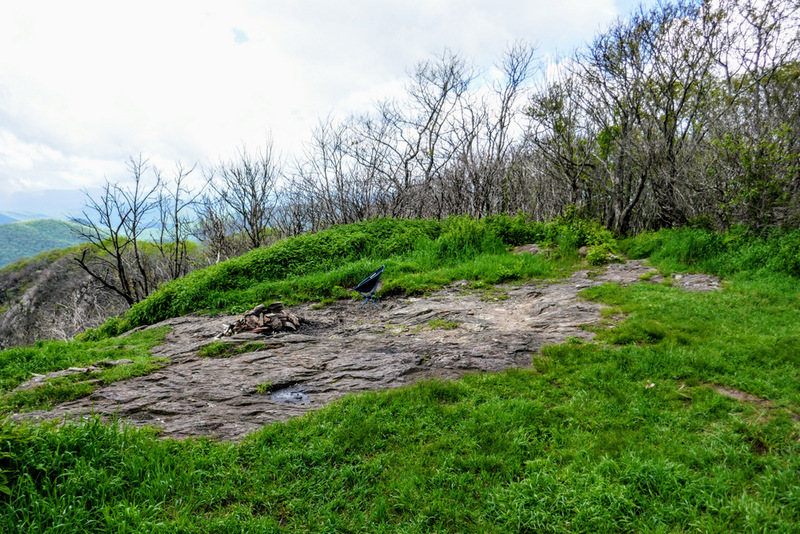 Mile 4.9 – Rock outcrops above the left side of the trail provide views east of the summit of Standing Indian. Down to the right is the pointy summit of Big Scaly. After these outcrops the AT drops 500 feet on 8 increasingly wider switchbacks. 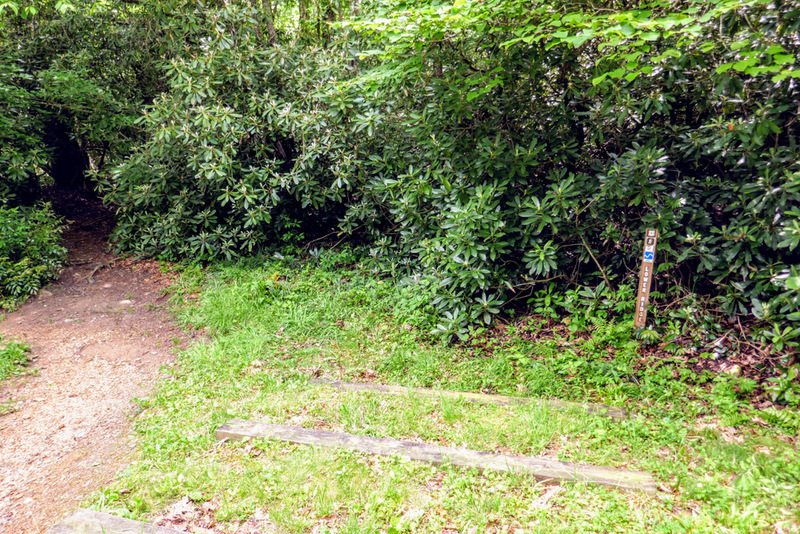 Mile 6.3 – Y-junction with the side trail to the Standing Indian Shelter. A trail to a water source is located on the right below the intersection. You are not allowed to camp on the north side of the trail. 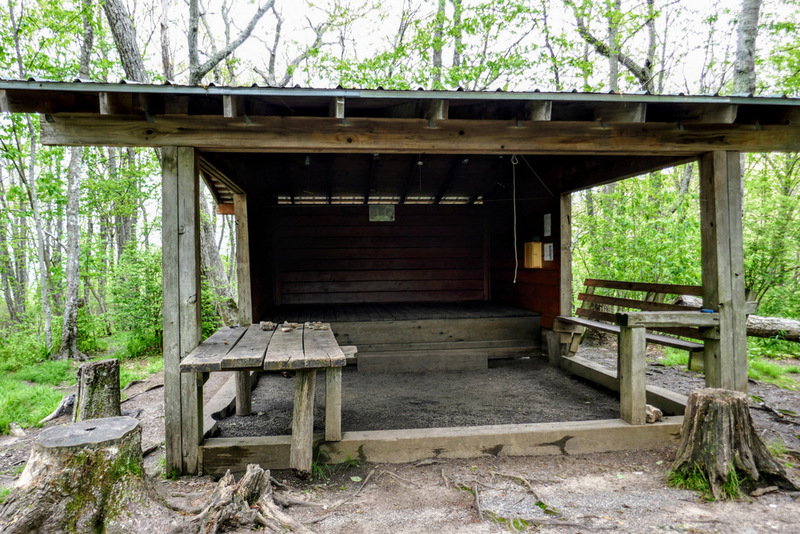 There are good campsites located near the shelter, and the privy is located south of the shelter. Mile 6.5 – T-junction with an unmarked trail on the left. This was the old route of the AT to Deep Gap. 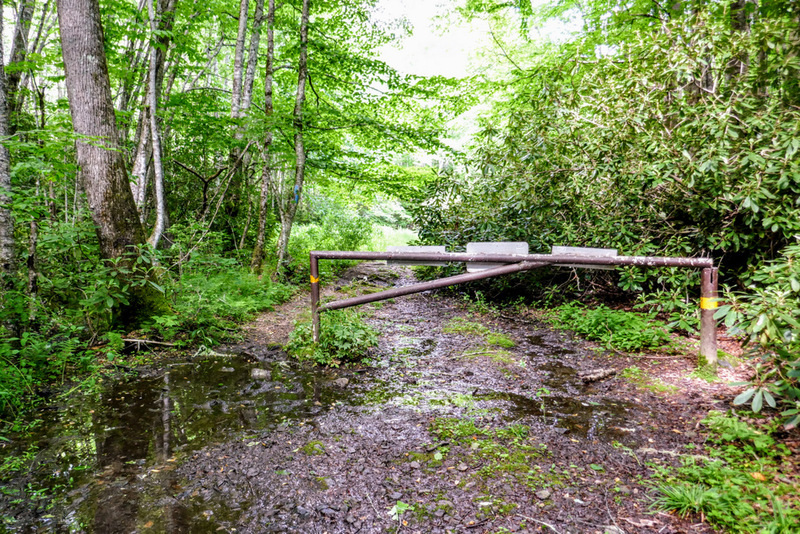 Mile 7.2 – The AT passes through Deep Gap crossing the parking area at the end of FR 71. Turn right and locate the blue-blazed Kimsey Creek Trail  branching left from FR 71. 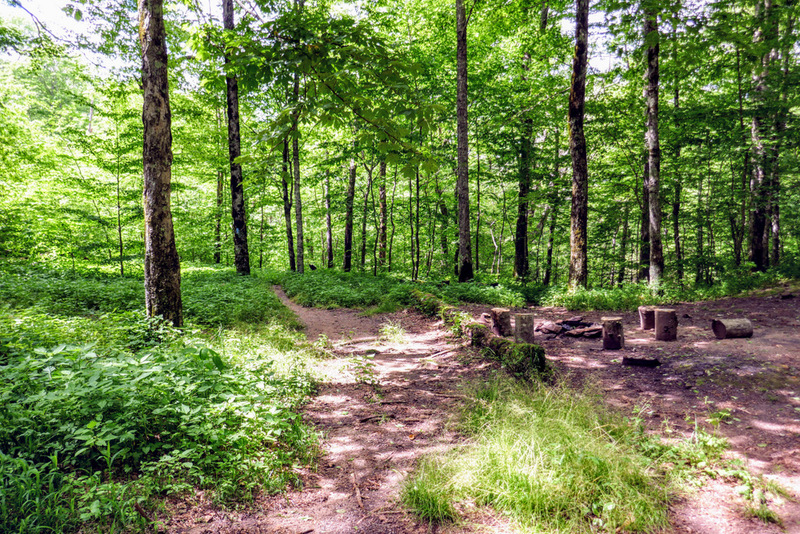 The trail passes through a large campsite. 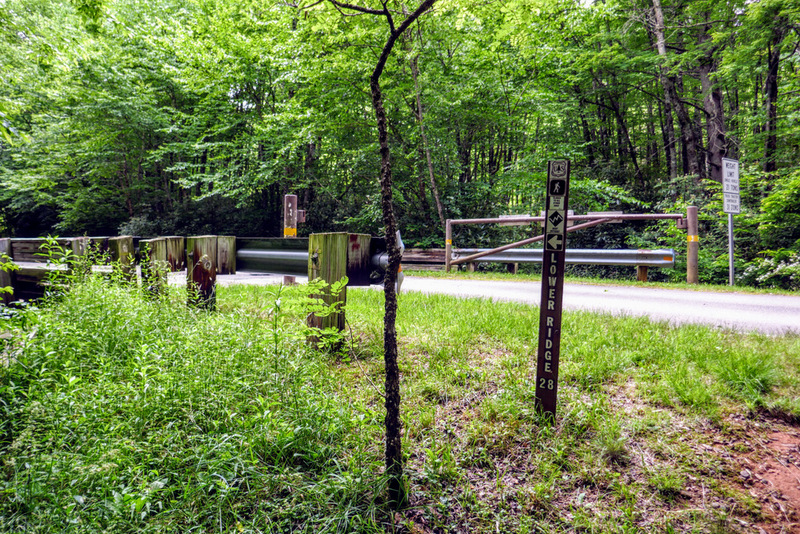 Mile 7.9 – The Kimsey Creek Trail briefly follows FR 7219 past a gate. 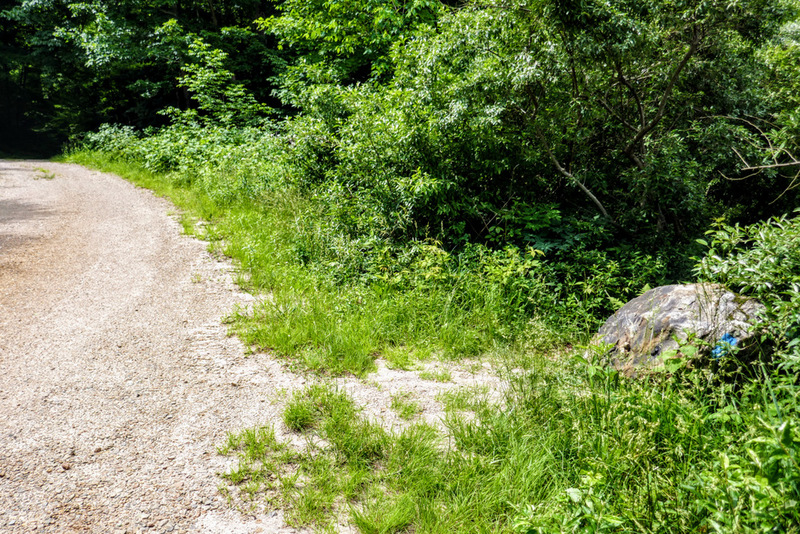 Before reaching FR 71, the trail turns right beside a large boulder. 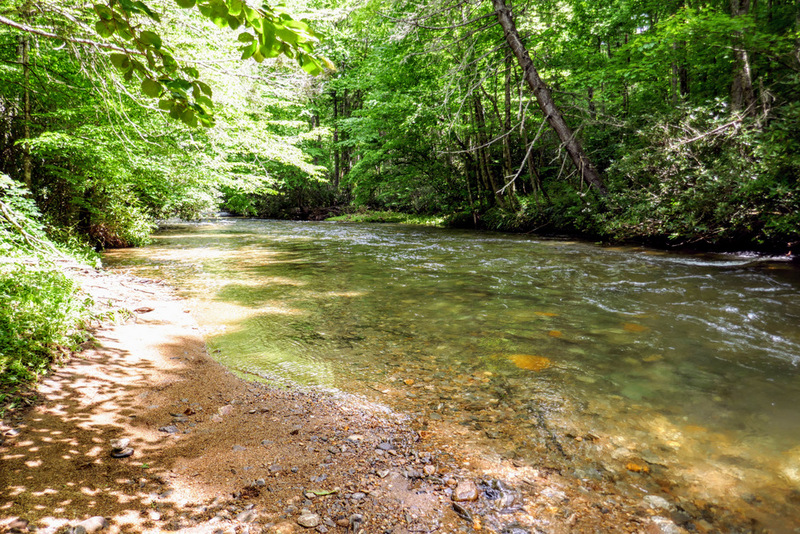 Mile 8.3 – Cross two small tributaries of Kimsey Creek in succession. 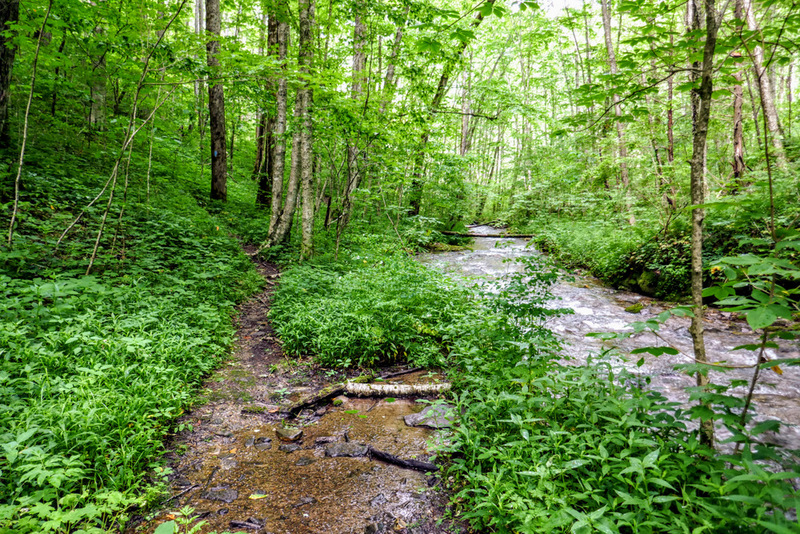 After these crossings the trail closely parallels Kimsey Creek. 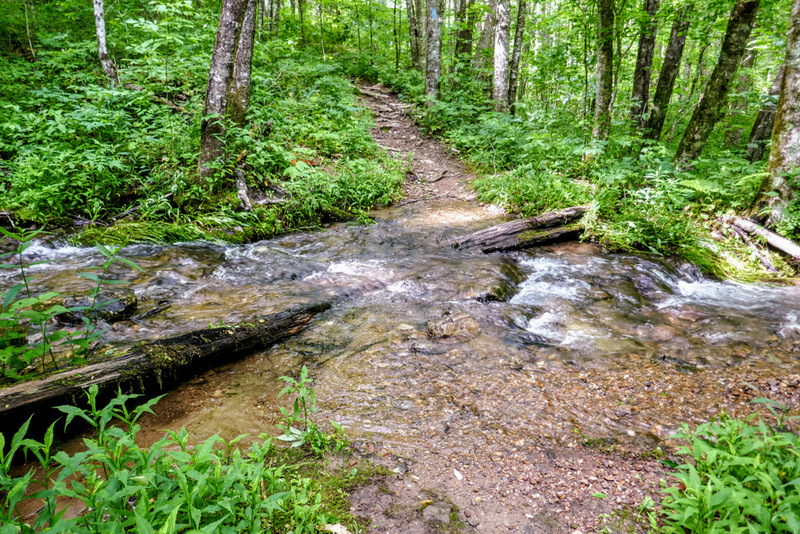 Mile 8.8 – Cross a large tributary of Kimsey Creek. 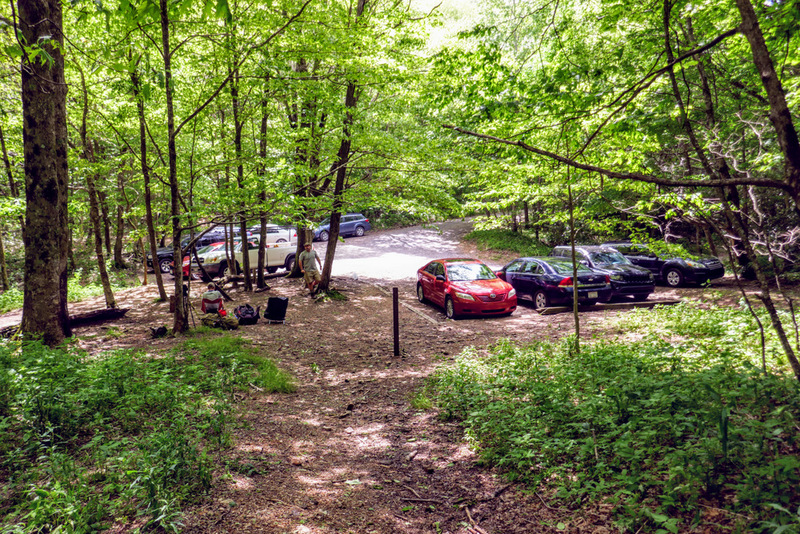 Mile 8.9 – Small campsite above the creek. After the campsite the trail drops back down the creek passing through a nice section of cascades. 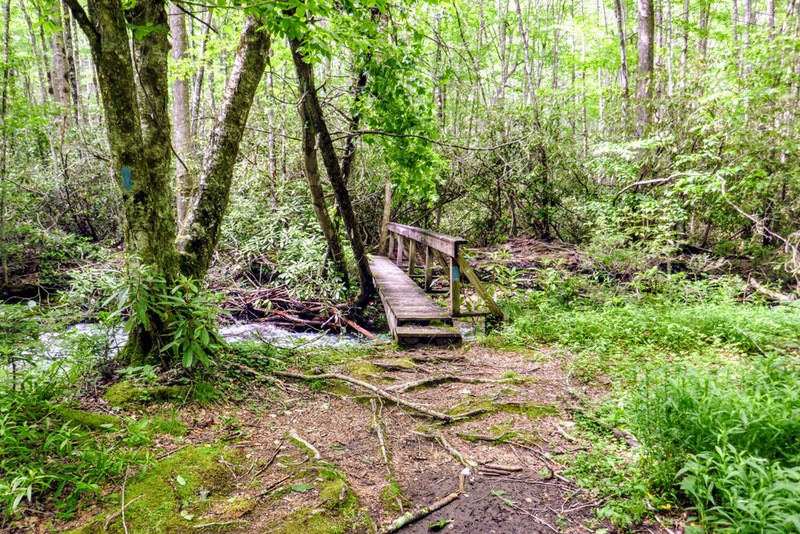 Mile 9.1 – Cross a single-rail wooden bridge over Kimsey Creek. 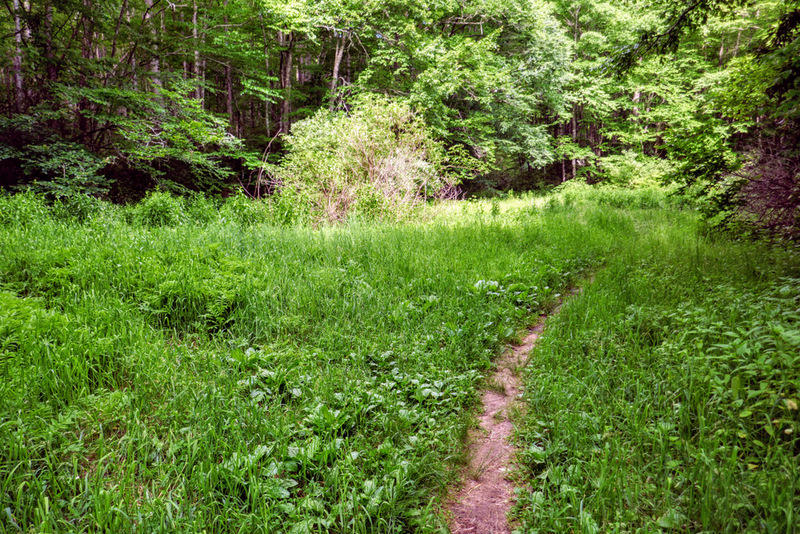 Mile 9.3 – Pass through a small field that is suitable for camping. 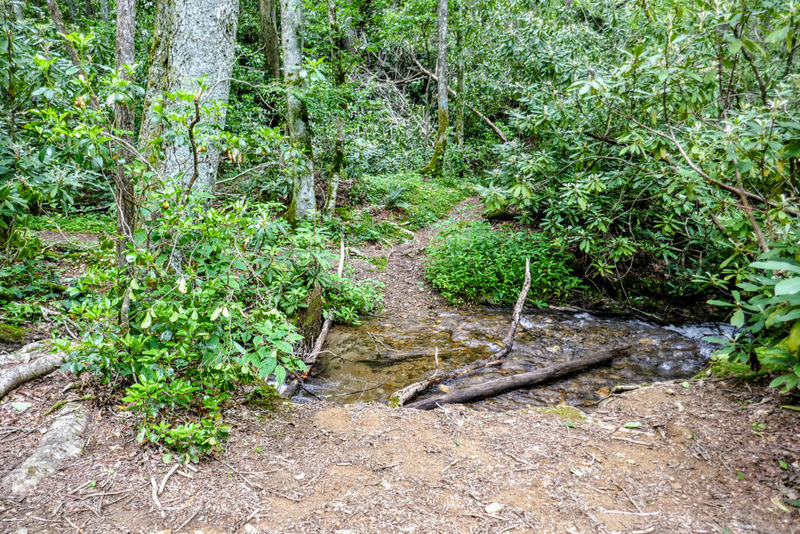 After the field the trail crosses Devils Prong on a single-rail wooden bridge. After the bridge the trail turns left and an overgrown forest road leads right connecting to FR 7219. 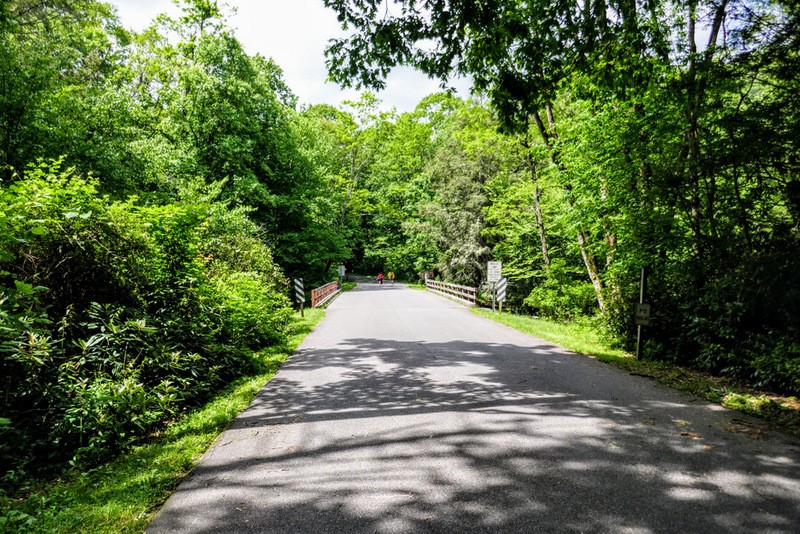 Mile 10.1 – Cross a single-rail wooden bridge over Kimsey Creek. Next you’ll pass a T-junction with a signed connector on the left to the Park Ridge Trail. Mile 10.3 – Walk around a gate for FR 424C1 entering a field. 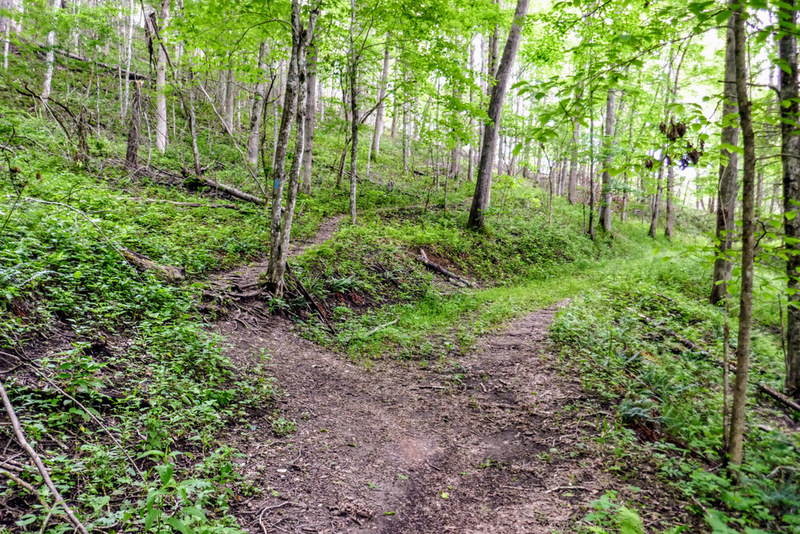 The trail makes a left turn in this field, but it isn’t obvious. 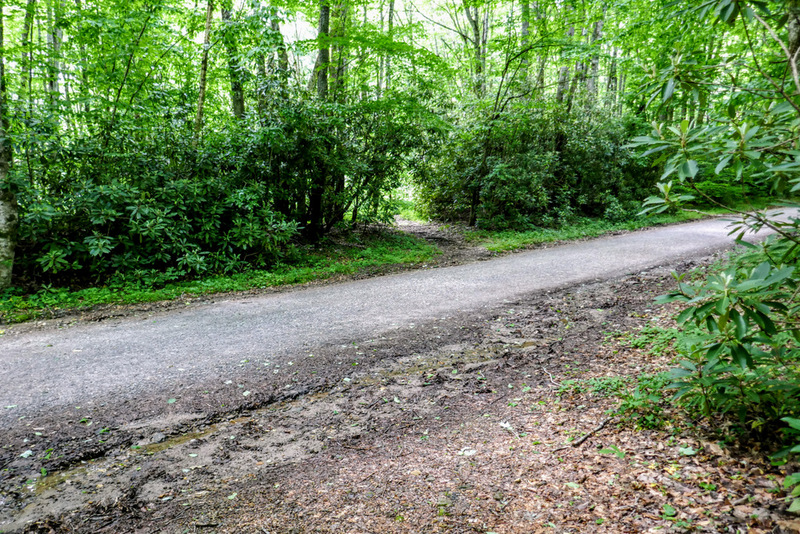 If you miss this left turn and go straight you will be ok since FR 424C1 brings you to the campground roads. Mile 10.6 – Turn left at a Y-junction with a forest road connector to FR 424C1 on the right. 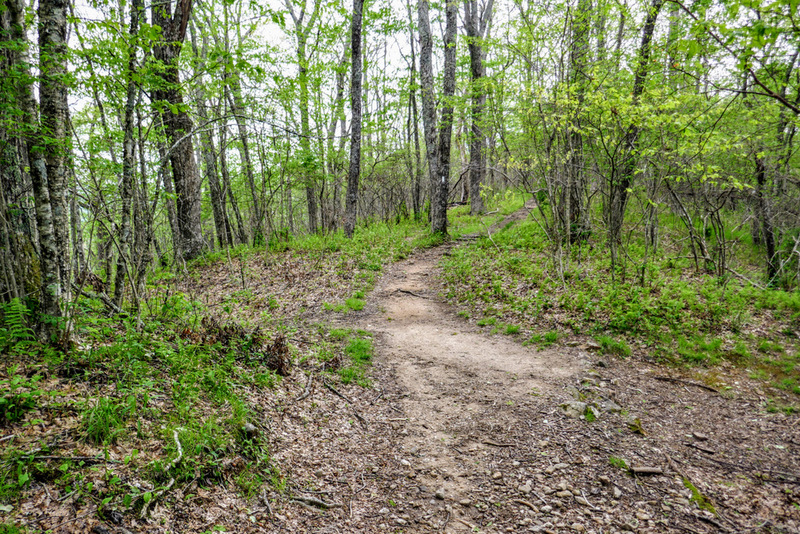 Mile 10.9 – Side trail to the amphitheater on the right. 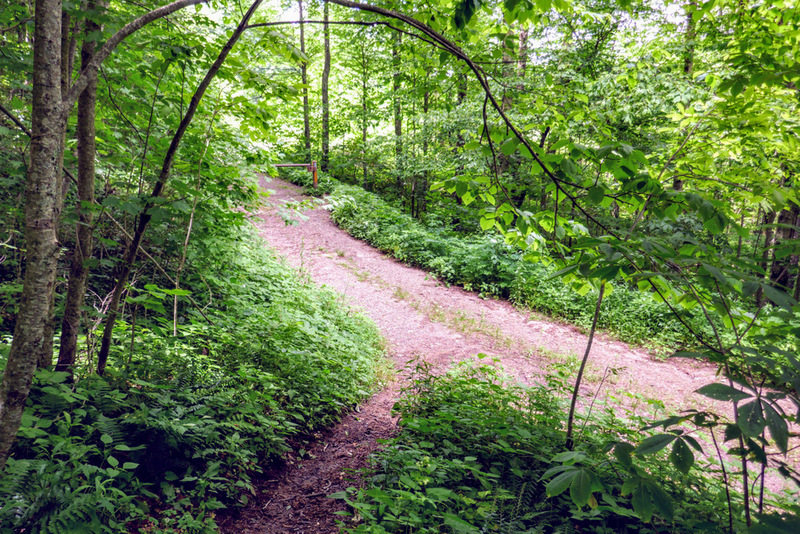 Mile 11.0 – Kimsey Creek Trail turns right at a T-junction with the trailhead for the Park Ridge Trail  (blue blaze) and Park Creek Trail  (blue blaze). 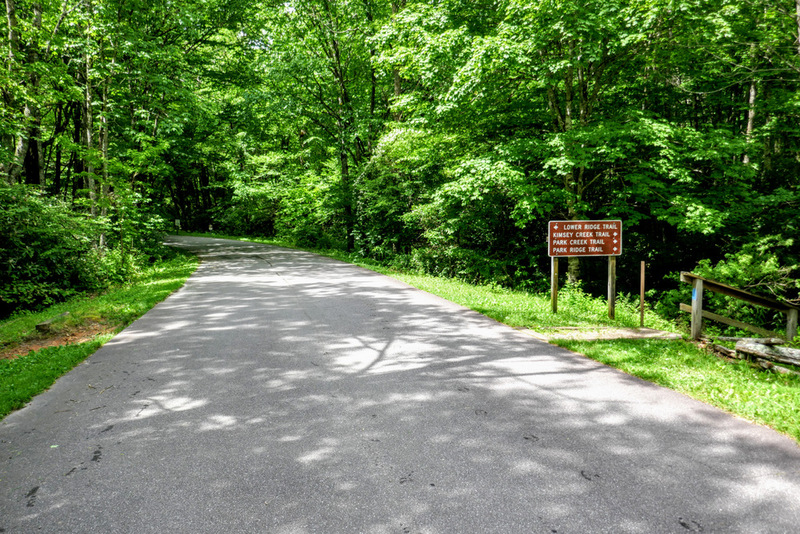 Mile 11.2 – Kimsey Creek Trail ends at Standing Indian Campground Rd. 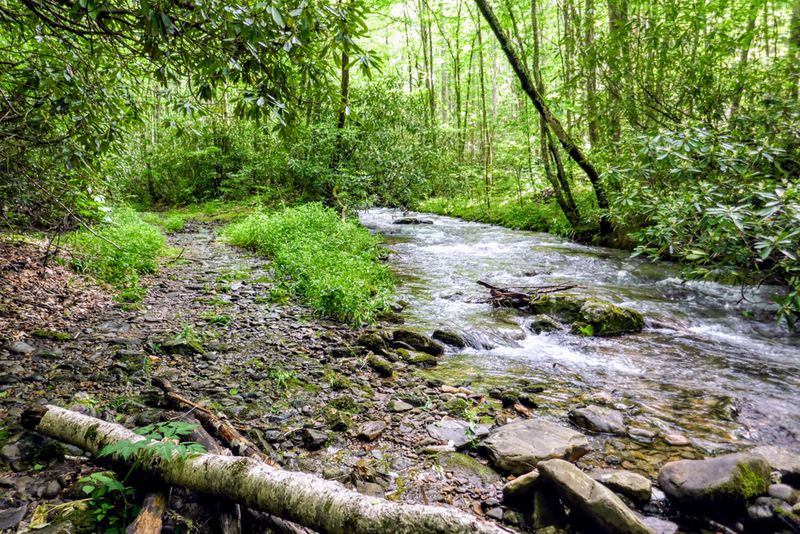 Turn left crossing the Nantahala River, then turn right on the Lower Trail Ridge Trail. 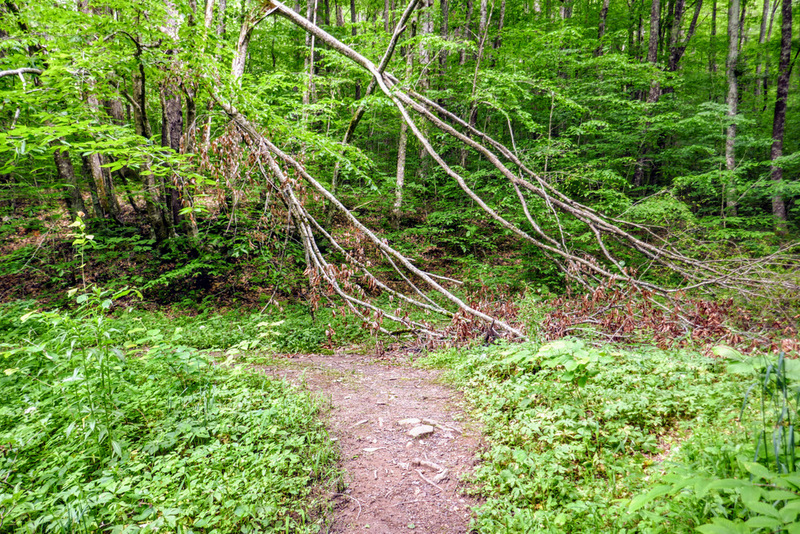 Mile 11.3 – Hike ends at FR 67.